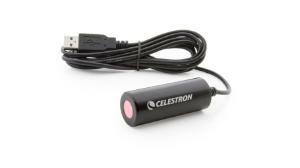 The Celestron Digital Microscope Imager turns traditional compound or stereo microscopes into a high-resolution digital imager using a personal computer, Chromebook, or LabQuest 2. The imager replaces the eyepiece of the microscope and connects directly to the device via USB. With its 2 megapixel sensor, built-in 15x lens, and IR cutoff filter, the Celestron Digital Microscope Imager works together with Logger Pro‘s Image and Video Capture capabilities to provide an easy way to collect still images, time-lapse sequences, and short videos. Chromebook users can use the built-in Camera App in Chrome to take pictures. LabQuest 2 users can use the built-in Camera App in LabQuest App to take pictures as well.